Some of you may know of Mayanin, It's my jewelry collection. It was launched in January. If you don't, then go and check it out! They're super cute and fun! Anyway, as a thank you for supporting Fashion Bananas and always being so caring, I want to GIVEAWAY one of my bracelets (of your choice) to two of my special readers! Also use CODE: BANANASFORYOU for 20% off all jewelry! All you have to do is leave me a sweet comment :-) along with your e-mail. and like my Facebook page. Not so hard right? Giveway and Discount will run until March 1st. Thank you for this! The bracelets look awesome! Congrats on the success. Oh my sweet Delmy! How can anyone leave a not, so sweet comment. Your so fab! Of course I already follow you on Facebook. Wow, i totally love your jewelry collection; super cute! Such beautiful bracelets. I only recently discovered your blog, and already love your style! I lovee your blog!! You have the perfect outfit for every occasion and such an inspiration to try daring things. Congratulations on your bundle of joy, I know they will be just as stylish as you are! Love the giveaway and the bracelets are super cute... as are u !! Long time fan, first time commenter! Follow you on facebook as "Uzma Noaman"
Aw, this would be so sweet to win! Left the wrong email - its adlopez6@gmail.com - oops! Those are really cute bracelets! A Jewelry Collection is perfect for you! Delmy, congratulations in your success and I have always love your style and blog. You are a real inspiration. Beautiful pieces and please wish me luck. Good luck to the rest of the entries as well. such beautiful pieces! Fingers Crossed!! 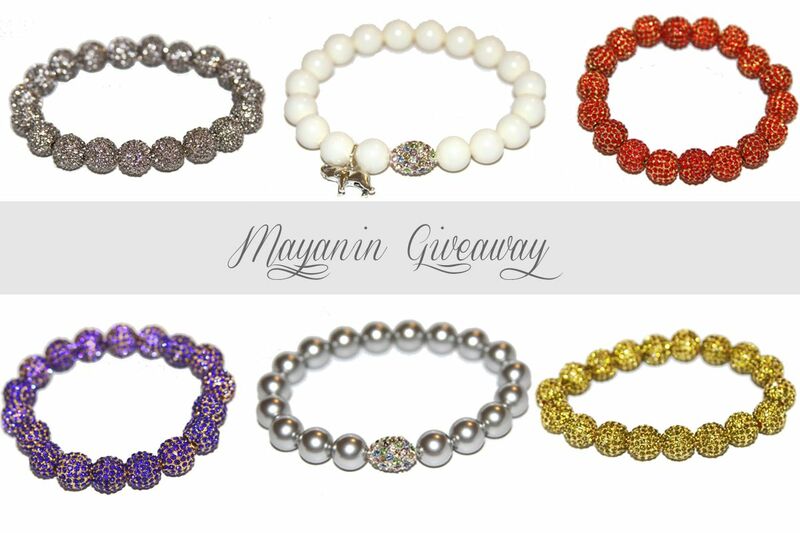 I'd love to win one of your bracelets!! These bracelets are super-cute, love the sparkles/crystals in them- they make them more unique! Oh wow these are beautiful. Liked you on Facebook (using a different email address). Congrats on your baby and blog success! Beautiful bracelets. Distinctive that you chose to do only bracelets. I particularly like the Pave Gold Plated Citrine stretch bracelet. Good luck with your line!! Love the purple and gold one! So fab! I'd wear these when my Surrobebe is born in a few months!! I'd wear these when I Pop out my Surrobebe in a few months!! you are really one of my favorite bloggers and I always admire your style and your feeling for fashion. You are such an inspiration. Wow!I like this giveaway.Your blog is so nice and lovely.Of course I liked it on facebook. Thank you..the giveaway and jewelry are lovely! I love the fashion posts you put on your blog, plus you look like such a sweet person in your photographs. Thanks for posting this giveaway, the bracelets are beautiful. Hope you pick me. Congrats by the way on your bundle of joy. I pray God's best for your new family. What a blessing to bring a baby into, what seems to be, a loving, established family unit. Between you, your sweetheart, and your relatives, she's got a lot of love welcoming her into the world. Thanks for this opportunity to win one of your gorgeous pieces! I can be reached at lneberhardt@gmail.com. The giveaway and jewelry are lovely! wow!! thank you so much for this giveaway ! Best wishes to you and yours on the soon to be born, sweet blessing! And on another note, I LOVE your jewelry line! Those are amazing :D thanks for the chance! I would like to win 1 for my wife! Liked your FB page! Sorry forgot to leave my email.